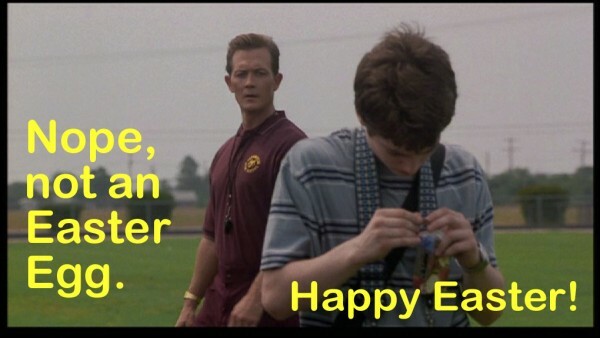 Hope you all are having wonderful Easters/Sundays/Whatevers! We don’t have any family things this year, so Sis decided to take plates of food to various homebound family members. She got all precooked stuff, but still good - ham, potatoes (in garlic sauce), mixed veggies, deviled eggs, rolls and pie. She made up a stack of plates with the food on them and we will be taking one each to Dad, his roommate, Grandma and the uncle that lives down the street from Grandma. We also gave one to our cousin who stopped by today to help put together the new guest bed and left one in the fridge for my brother to have on a lunch break this week, as he’s been working down the street at Mom’s house doing some construction for her. I get all the leftovers! Well, I have to share a little bit with my sister, but mostly I get all the leftovers. When I told my dad we were coming for a visit this weekend, he said, “Oh good, I need someone to take my recyclables.” I said, “That’s it, that’s the only reason you’re excited?” And he goes, dead serious, “Well, no, you’re bringing the dog too, right?” I’m like, “Yeah, okay, Dad, I know the dog outranks your own kids, damn.” Dads, I swear. Anyways, we are going to have delicious Easter dinner and hopefully some nice visits too. Have this card I made. Happy Easter! My Mom and I have been baking most of the day, she made lemon meringue pie and I'm making Greek Easter bread so its braided. I hope you have a wonderful day and give all the kitties and dogs snugs for me. Ooohhh, Greek Easter Bread. My mom used to make the best Easter bread. It was so soft and warm and round and braided and had a hole in the center where she'd put hard boiled eggs, so you got a little bit of egg with every slice of bread. My mouth is watering just thinking about it! Glad to hear you had such a nice Easter! We hung around the house, I played video games, then had spaghetti and meatballs for dinner because it had gotten too late to make what I planned on making, which was lamb and sweet potatoes and veggies. Tonight will be Easter for me, I guess, LOL.